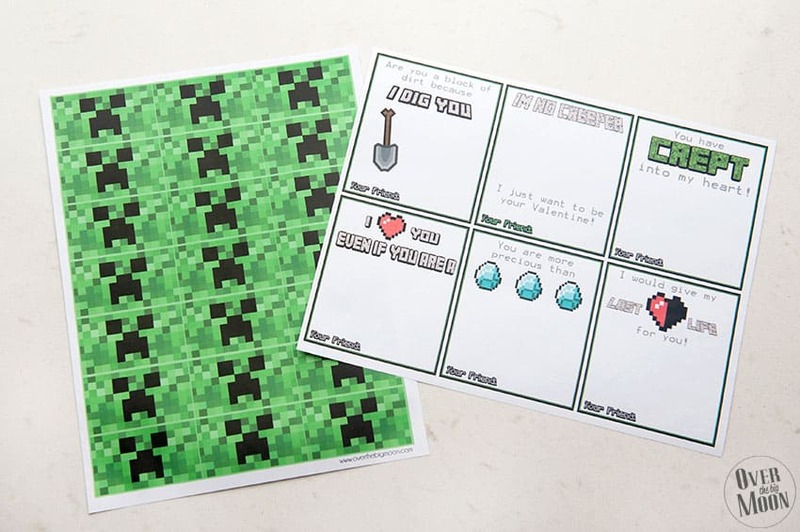 These Free Printable Minecraft Valentines are perfect for those little Minecraft lovers! 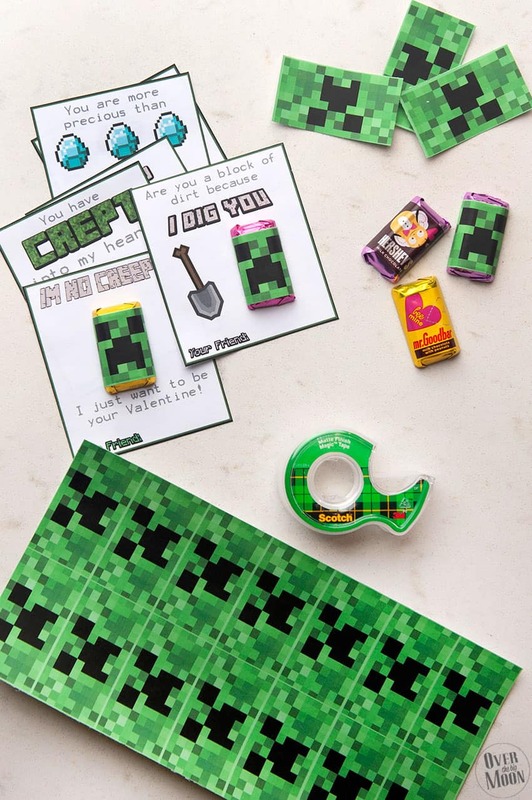 Just print the Valentine and Creeper candy wrapper and you’re ready to go! Like most young boys, mine can not get enough of Minecraft! I decided to create Valentines this year in honor of the game that successfully succeeded in making me motion sick! Am I the only Mom who has a hard time when their kids want to show them something on Minecraft? I can ride rollercoasters all day long and read in the car, but Minecraft makes me dizzy! 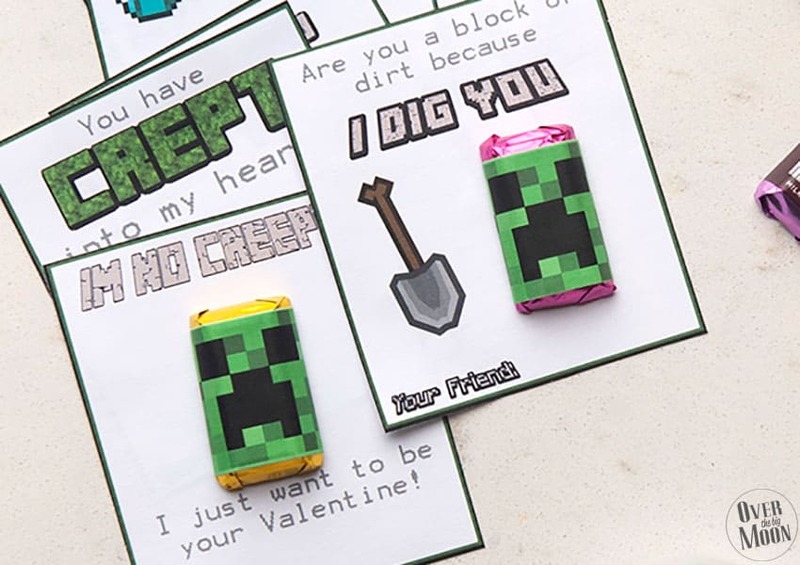 If you love these, don’t forget to check out the PINK Minecraft Valentine’s! Use tape to secure the mini candy bar wrapper on the mini candy bars! Instant Creepers! Attach them to the printed Valentine using tape, have your kiddo sign their name and you’re good to go! This Valentine is especially perfect for older Elementary kids! No having to be embarrassed! My boys were SO excited, which makes this Mom very happy! But, of course they work for all ages! 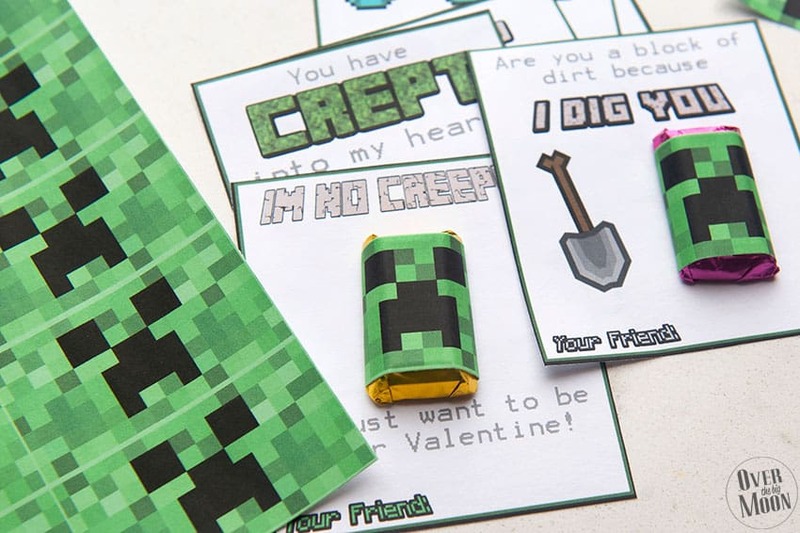 Download the Minecraft Valentine’s Here! 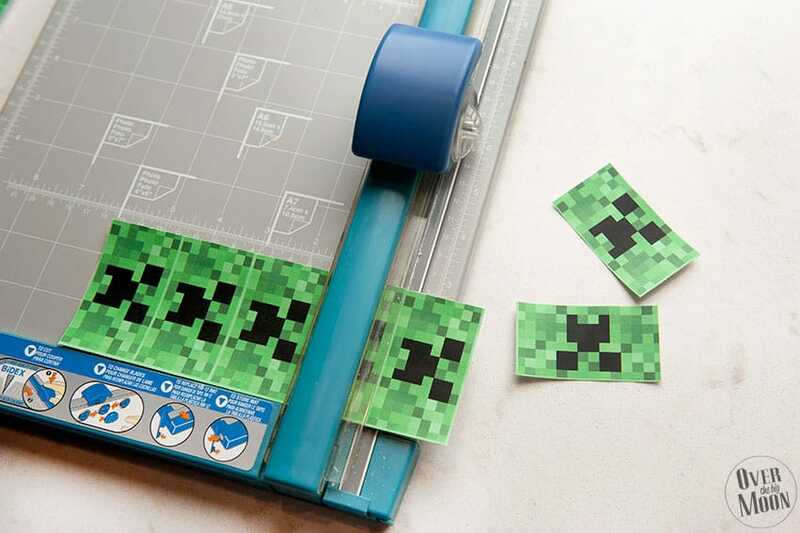 Download the Creeper Wrapper Here! *This post was originally posted in January 2014 and has been updated! And don’t forget to pin the image below! Thanks friends! my daughter is going to be so excited when i show her these! my two boys are gonna flip when they see these!! thank you!! These are fantastic! Thank you!! Creeper Wrappers are the best! My daughter loves them! Thank you SO much for making these available for free. My son is going to love these and it is going to save me so much time! It is always difficult finding Valentines for boys to give boys. I think the “You Rock” card would be the most appropriate but I only see it in the pink? Oops! The “You Rock” isn’t part of this collection. I do love these designs but which do you think would be appropriate for boys to give boys? You are making us ALL moms-of-the-year!!! Thank you!!! You have just made two VERY happy boys!! Thank you for taking the time to make them and sharing with us. Thank you! 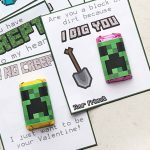 My son loves this game and I was hoping that this year, as it’s continued to grow in popularity and more licensed goods are available in stores I could find Minecraft valentines. No go. But these? They are adorable, easy, and he is going to LOVE them. Also, no one else in his class will have them. Thank you so much for sharing these!!! THANK YOU from a Mom of 3 boys who refuse to have any cards other than Minecraft !!!! You have saved my life!!! XOXOXOXOXO!!!! thank you! it’s very kind of you to share these and I know my son will be so excited to share these with his class (he’s in 2nd grade)! Thank you so much! 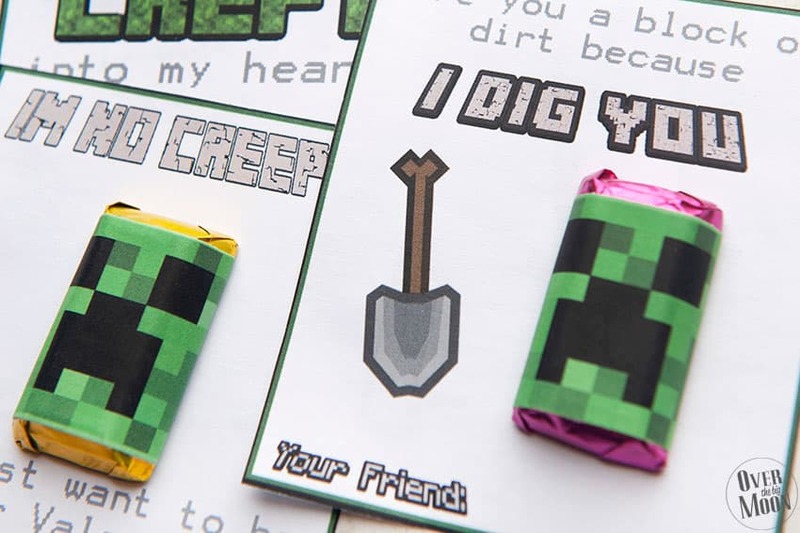 My boys wanted Minecraft Valentines…but they were no where to be found. These are awesome!